A touchstone is a means of determining what a thing should be as applied to any definite rule, principle, or measure established by authority. The most common modern reference for "touchstone" is for assaying the quality of gold by means of dark schist or jasper. A touchstone, therefore, is a means of measuring the quality of something. The touchstone is used as a 'test' to prove the reality of the thing being tested. While the outcome may well indeed be "rejected," the test itself is one of a positive nature. 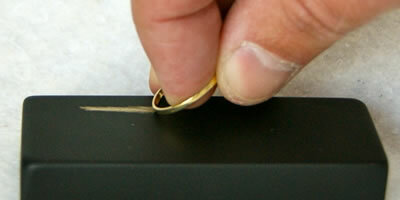 For instance, the touchstone for gold is designed to recognize that which is in reality, gold. If the metal does not measure up to the standard of the touchstone, then it stands rejected, because it obviously is not gold. The only reason it was brought to the stone is the claim that the piece was, indeed, gold. I've heard it said in times past, "If you were arrested for being a Christian, would there be enough evidence to convict you?" The Apostle Paul would have agreed with such a sentiment. The two words—examine and test—are Greek synonyms. They are different in spelling, but mean essentially the same thing: "to test for the sake of approval." Paul is saying to us, "Rub yourself on the touchstone so you can see if your faith is genuine." I believed God for a new car, and I got one. I believed God for a healing, and I was healed. Pardon me, but that is not the touchstone. That is the faith. Faith in your faith is no way to measure the quality of that faith. That is similar to rubbing a piece of gold with a piece of gold to see if it is truly gold. The touchstone for examining your faith is something other than faith. It must be something that will reveal the genuineness of your faith. Well, I got my car I was believing for. Doesn't that prove my faith is genuine? "The proof is in the pudding" is man's way of thinking, not God's. Just because something 'works' is no sign that God is in it. Sorcery 'works,' but God opposes its use. Divination 'works,' but God is opposed to it. Commercialized religion 'works,' but finding God in it is stressful. Simply because something 'works' is not a proof of God's blessing. Before we get completely sidetracked and lost, let's return to the verse. It did NOT say "Examine your faith." It said "Examine yourself." Examine yourself. Put yourself to the test. Check to see if you really are in the faith, and that the faith you are in is the right one. One thing to note in this is that it is not a one-off type exam. The imperative verb, 'examine,' is in the present tense active voice, which indicates that this should be an ongoing practice. It is not something that you do once and say, "Okay. I'm good. I've passed the test." Neither is this a morbid "searching for sin" that some seem to promote. Plain and simple, this is checking to make sure that we are going in the right direction on the correct path. To do this we need a touchstone, a standard, something by which to measure our process and progress. That touchstone, the standard by which we measure ourselves is the Word of God, which is found in the Bible. The first of John's epistles is dedicated to helping believers know whether their faith is genuine. The word "know" occurs 27 times in 22 verses in the KJV, and 35 times in 29 verses in the NLT. One can do no better than to go through this simple letter from the Apostle of Love and measure oneself against the standards God has placed in His Word. That is where we will begin our next series of studies.